Manufacturer & Exporter of Stainless Steel 304 Round Bars & UNS S30400 Round Rods, SS 304 Bright Bars, Steel UNS S30400 Rods, 304 Hexagonal Bar Suppliers in India. 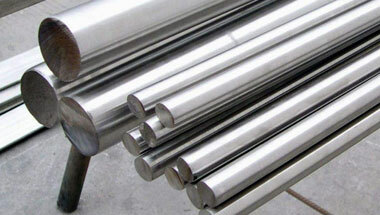 Neon Alloys is one of the most reputed Manufacturer and Exporters in Stainless Steel 304 Round Bars in different type of thickness, specification, grades and dimensions. These SS 304 Round Bars are manufactured with precision using excellent quality material & contemporary techniques by our experienced professionals. The 304 stainless steel round bars can be used in a wide variety of industries and for a multitude of applications such as Food, Dairy, Beverage, Paper, Chemical, Cryogenic, Automotive and Aerospace industries etc. It has great drawing, stamping, and forming properties. This is an 18/8 chromium-nickel metal, which means it has been alloyed with 8 percent nickel and 18 percent chromium. It is an austenitic metal, meaning it is non-magnetic. SS 304 Round Bars available in different sizes, shapes, finishes and dimensions, all our products require less maintenance and are ideal for high temperature & pressure applications. Stainless Steel 304 Round Rods Manufacturer, SS 304 Forged Bar, Steel 304 Hex Bar, Stainless 304 Hollow Bar, Werkstoff nr. 1.4301 Black Bars Supplier in India. Africa, Chine, Bahrain, Canada, Azerbaijan, Sri Lanka, London, Kuwait, Thailand (Bangkok), Ethiopa, Morocco, Venezuela, Brazil, Colombia, Malaysia, Iran, Angola, Dubai, Trinidad and Tobago, Vietnam, Argentina, Italy, Kazakhstan, Peru, United States, Tunisia, Cameroon, Algeria, New Zealand, Houston, UAE, Ghana, Democratic Republic of the Congo, South Africa, Uganda, Egypt, Nigeria, Germany, Saudi Arabia, Mexico, UK, Russia, Jordan, Turkey, Sudan, Indonesia, Australia, Mozambique, Israel, Iraq. Omdurman, Aqaba, Tripoli, Data from the UN, Mecca, Algiers, Jeddah, Kolwezi, Dar es Salaam, Dakar, Istanbul, Bethlehem, Port Harcourt, Nairobi, Lagos, Maputo, Casablanca, Yaoundé, Soweto, Hong Kong, Lusaka, Cairo, Ouagadougou, Conakry, Zaria, Benin, Kaduna, Addis Ababa, Giza, Muscat, Cairo, Amman, Brazzaville, Maiduguri, Bamako, Manama, Dammam, Doha, Antananarivo, Lubumbashi, Durban, Colombo, Accra, Pretoria, Rabat, Subra al-Haymah, Dubai, Ibadan, New York, Tehran, Riyadh, Cape Town, Abidjan, Jerusalem, Alexandria, Mbuji-Mayi, Singapore, Tel Aviv, Harare, Fez, Sharm el-Sheikh, Luanda, Beirut, Mogadishu, Kampala, Khartoum, Byblos, Johannesburg, Kinshasa, Kano, Douala, Abu Dhabi, Freetown, Port Elizabeth, Bulawayo.